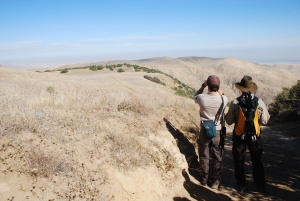 It’s hard to figure out which is more impressive to watch – the magnificent California condors effortlessly gliding overhead or the enraptured faces of bird lovers gathered here to spend some quality time with the largest terrestrial bird in North America. About 30 folks signed up to venture into the Bitter Creek National Wildlife Refuge (normally closed to the public) for a guided walk to see the condors in action. 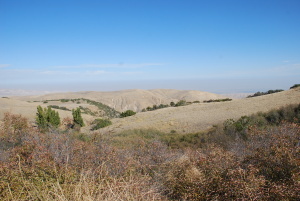 Bitter Creek is located just north of the Grapevine near the towns of Taft and Maricopa in the San Joaquin Valley foothills of Kern County. Sure it’s a schlep from the Los Angeles area, but once on the small roads, it’s a kick-back ride into some mouth-dropping country. All this beauty off the 5 near the Grapevine? Who freaking knew? …and into Bitter Creek Canyon, walkers were stop-in-your tracks mesmerized as various condors circled above and kept the crowd’s attention for more than an hour. Not to be outdone, a band of ravens pestered their winged cousins, flapping up to bother and “touch wings” with the condors. (Why do they do that? Theories were bandied about but with no clear reasoning, the only explanation was pure “short kid” annoyance.) Overall, the birds supplied a fine aerial show with no causalities. 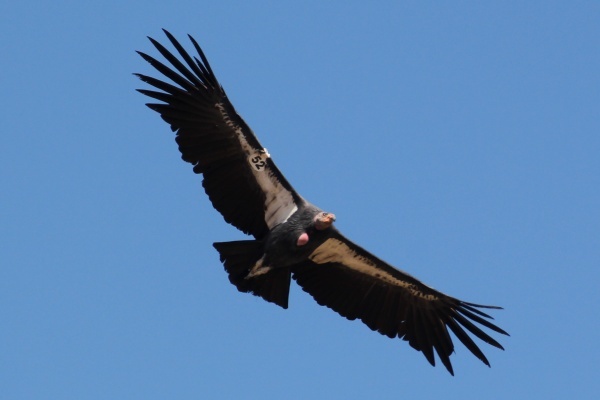 “This historically has been a place for condor territory mainly because of the thermal air currents,” says Michael Woodbridge of the Fish and Wildlife Service. But the site also significantly marks condor history – it’s the site where the last wild female condor was trapped in 1986. 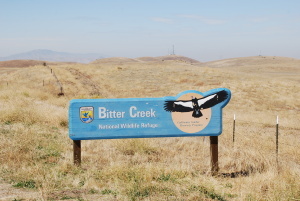 Bitter Creek was established in 1985 as one SoCal area for condor recovery; nearby Hopper MountainWildlife Refuge is another local site. Like many wild things, at one time, condors filled the skies, invoked reverence from local Native Americans and found life pretty darn easy. 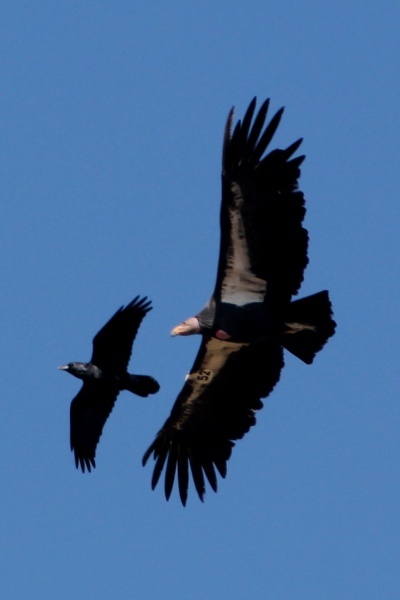 Thousands of condors ranged the west coast from British Columbia to Baja, but with the advent of the Europeans in the area, the birds faced a downhill battle. They were shot at and poisoned, they collided with man-made structures and died, their once endless territories eroded to a few parcels of land. Beginning as early as the 1950s, conservationists rallied around the bird; however, their protests often fell on deaf ears. But in 1982, when a mere 22 condors were left in the world, folks decided to reverse the trend. Now, trying to recreate a species, captive breeding programs in California, Arizona and Baja California have been successful in upping the bird’s number. From the 27 birds in the original captive flock, today nearly 400 birds have taken in the breath of life. 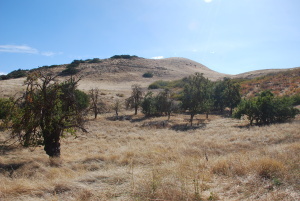 Here at Bitter Creek, 47 condors call the 14,000 square feet of sloping hills and deep canyon home. All birds have transmitters and are closely watched. The public isn’t allowed into their territory. “New release” condors receive supplemental feeding (aka carted in carcasses) to help them adjust to the thrill of finding large animal remains (non-native wild pigs, cattle, sheep and deer) in their territory. Gone are the days when herds of Tule elk, pronghorn or mule deer would suffice these first-rate scavengers, but with the advent of ranching and farming, the condors have found new menus. Pickins maybe slim, but there is enough natural death for the condors to survive. Indeed, despite the joy of seeing the birds soaring in the clear sky, there is a profound melancholy. Their existence is so depended on humans, from birth to death – even living in the wild. We take eggs of wild condors and replace with captive eggs to ensure new hatchlings will be viable. We monitor their every move, especially parents in the nest. We feed them and try our dardest to keep them from ingesting lead from hunter-killed critters or micro-trash that tarnishes our wilderness areas. Is this collective psychic guilt from what we did to them long ago? A poetic selfish dream to see them again up high? A biological determination for diversity? 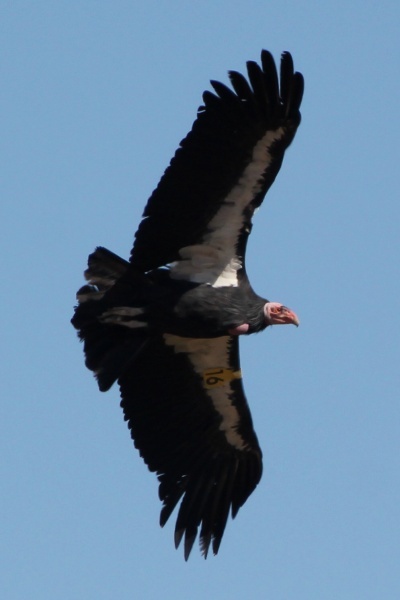 Whatever the reason, the move to protect and propagate self-sustaining California condors is a massive undertaking that won’t be fully realized in our lifetimes. Woodbridge announced to the walkers that the FWS is working on a Comprehensive Conservation Plan (CCP) that will cover management of three condor-related national wildlife refuges (Bitter Creek, Blue Ridge and Hopper Mountain). In January 2012, the first draft will be issued and the public is welcomed to add their comments and suggestions. 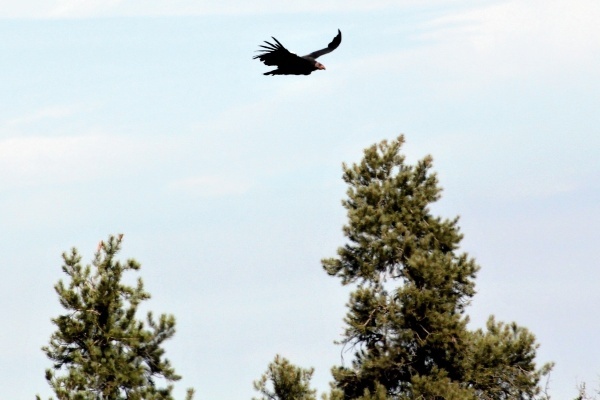 For the condors, it’s just one flap at a time as they swoop and soar on the updrafts, holding on as they glide higher. One thing for sure, the landscape would surely seem emptier and even sadder without them.